German Americans (German: Deutschamerikaner) are Americans who have full or partial German ancestry. With an estimated size of approximately 44 million in 2016, German Americans are the largest of the self-reported ancestry groups by the US Census Bureau in its American Community Survey.. (Due to changes in the way demographic surveys are carried out English-Americans which are the largest ethnicity group in America tend to get under-counted) This group accounts for about one third of the total ethnic German population in the world. Nationwide, though less common in New England, California, New Mexico and the Deep South. Plurality in Pennsylvania, Colorado and the Midwest. None of the German states had American colonies. In the 1670s, the first significant groups of German immigrants arrived in the British colonies, settling primarily in Pennsylvania, New York, and Virginia. Immigration continued in very large numbers during the 19th century, with eight million arrivals from Germany. Between 1820 and 1870 over seven and a half million German immigrants came to the United States. By 2010, their population grew to 49.8 million immigrants, reflecting a jump of 6 million people since 2000. There is a "German belt" that extends all the way across the United States, from eastern Pennsylvania to the Oregon coast. 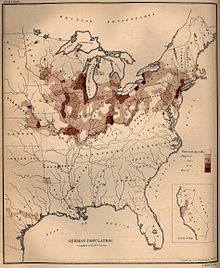 Pennsylvania has the largest population of German-Americans in the U.S. and is home to one of the group's original settlements, Germantown (Philadelphia), founded in 1683 and the birthplace of the American antislavery movement in 1688, as well as the revolutionary Battle of Germantown. The state of Pennsylvania has 3.5 million people of German ancestry. They were pulled by the attractions of land and religious freedom, and pushed out of Germany by shortages of land and religious or political oppression. Many arrived seeking religious or political freedom, others for economic opportunities greater than those in Europe, and others for the chance to start fresh in the New World. The arrivals before 1850 were mostly farmers who sought out the most productive land, where their intensive farming techniques would pay off. After 1840, many came to cities, where "Germania"—German-speaking districts—soon emerged. German Americans established the first kindergartens in the United States, introduced the Christmas tree tradition, and introduced popular foods such as hot dogs and hamburgers to America. The great majority of people with some German ancestry have become Americanized and can hardly be distinguished by the untrained eye; fewer than 5% speak German. German-American societies abound, as do celebrations that are held throughout the country to celebrate German heritage of which the German-American Steuben Parade in New York City is one of the most well-known and is held every third Saturday in September. Oktoberfest celebrations and the German-American Day are popular festivities. There are major annual events in cities with German heritage including Chicago, Cincinnati, Milwaukee, Pittsburgh, San Antonio, and St. Louis. The Germans included many quite distinct subgroups with differing religious and cultural values. Lutherans and Catholics typically opposed Yankee moralizing programs such as the prohibition of beer, and favored paternalistic families with the husband deciding the family position on public affairs. They generally opposed women's suffrage but this was used as argument in favor of suffrage when German Americans became pariahs during World War I. On the other hand, there were Protestant groups that emerged from European pietism such as the German Methodist and United Brethren; they more closely resembled the Yankee Methodists in their moralism. Large sections of Pennsylvania, Upstate New York, and the Shenandoah Valley of Virginia attracted Germans. Most were Lutheran or German Reformed; many belonged to small religious sects such as the Moravians and Mennonites. German Catholics did not arrive in number until after the War of 1812. In 1709, Protestant Germans from the Pfalz or Palatine region of Germany escaped conditions of poverty, traveling first to Rotterdam and then to London. Anne, Queen of Great Britain, helped them get to her colonies in America. The trip was long and difficult to survive because of the poor quality of food and water aboard ships and the infectious disease typhus. Many immigrants, particularly children, died before reaching America in June 1710. They kept to themselves, married their own, spoke German, attended Lutheran churches, and retained their own customs and foods. They emphasized farm ownership. Some mastered English to become conversant with local legal and business opportunities. They tolerated slavery (although few were rich enough to own a slave). The most famous of the early German Palatine immigrants was editor John Peter Zenger, who led the fight in colonial New York City for freedom of the press in America. A later immigrant, John Jacob Astor, who came from Baden after the Revolutionary War, became the richest man in America from his fur trading empire and real estate investments in New York. John Law organized the first colonization of Louisiana with German immigrants. Of the over 5,000 Germans initially immigrating primarily from the Alsace Region as few as 500 made up the first wave of immigrants to leave France en route to the Americas. Less than 150 of those first indentured German farmers made it to Louisiana and settled along what became known as the German Coast. With tenacity, determination and the leadership of D'arensburg these Germans felled trees, cleared land, and cultivated the soil with simple hand tools as draft animals were not available. The German coast settlers supplied the budding City of New Orleans with corn, rice, eggs. and meat for many years following. The Jesuit Charlevoix traveled New France (Canada and Louisiana) in the early 1700s. His letter said "these 9,000 Germans, who were raised in the Palatinate (Alsace part of France) were in Arkansas. The Germans left Arkansas en masse. They went to New Orleans and demanded passage to Europe. The Mississippi Company gave the Germans rich lands on the right bank of the Mississippi River about 25 miles (40 km) above New Orleans. The area is now known as 'the German Coast'." Two waves of German colonists in 1714 and 1717 founded a large colony in Virginia called Germanna, located near modern-day Culpeper, Virginia. Virginia Lieutenant Governor Alexander Spotswood, taking advantage of the headright system, had bought land in present-day Spotsylvania and encouraged German immigration by advertising in Germany for miners to move to Virginia and establish a mining industry in the colony. The name "Germanna", selected by Governor Alexander Spotswood, reflected both the German immigrants who sailed across the Atlantic to Virginia and the British Queen, Anne, who was in power at the time of the first settlement at Germanna. In the Georgia Colony, Germans mainly from the Swabia region settled in Savannah, St. Simon's Island and Fort Frederica in the 1730s and 1740s. They were actively recruited by James Oglethorpe and quickly distinguished themselves through improved farming, advanced tabby (cement)-construction, and leading joint Lutheran-Anglican-Reformed religious services for the colonists. Between 1742 and 1753, roughly 1,000 Germans settled in Broad Bay, Massachusetts (now Waldoboro, Maine). Many of the colonists fled to Boston, Maine, Nova Scotia, and North Carolina after their houses were burned and their neighbors killed or carried into captivity by Native Americans. The Germans who remained found it difficult to survive on farming, and eventually turned to the shipping and fishing industries. The tide of German immigration to Pennsylvania swelled between 1725 and 1775, with immigrants arriving as redemptioners or indentured servants. By 1775, Germans constituted about one-third of the population of the state. German farmers were renowned for their highly productive animal husbandry and agricultural practices. Politically, they were generally inactive until 1740, when they joined a Quaker-led coalition that took control of the legislature, which later supported the American Revolution. Despite this, many of the German settlers were loyalists during the Revolution, possibly because they feared their royal land grants would be taken away by a new republican government, or because of loyalty to a British German monarchy who had provided the opportunity to live in a liberal society. The Germans, comprising Lutherans, Reformed, Mennonites, Amish, and other sects, developed a rich religious life with a strong musical culture. Collectively, they came to be known as the Pennsylvania Dutch (from Deutsch). Etymologically, the word Dutch originates from the Old High German word "diutisc" (from "diot" "people"), referring to the Germanic "language of the people" as opposed to Latin, the language of the learned (see also theodiscus). Only later did the word come to refer to the people who spoke a Germanic language, and only in the last 1-2 centuries to refer only to the people of the Netherlands. Other Germanic language variants for "deutsch/deitsch/dutch" are: Dutch "Duits" and "Diets", Yiddish "daytsh", Danish/Norwegian "tysk", or Swedish "tyska." The Japanese "doitzu" also derives from the aforementioned "Dutch" variations. There were few German Catholics in Pennsylvania before the 1810s. The King of Great Britain, whose King George III was also the Elector of Hanover in Germany, hired 18,000 Hessians (career soldiers from small German states) to support British forces. Many were captured; they remained as prisoners during the war but some stayed and became U.S. citizens. German Americans served on both sides of the American Revolution. The religious minorities were neutral. The Lutherans were split. In New York, many were neutral or supported the Loyalist cause. In Pennsylvania most were on the patriot side. The Muhlenberg family, led by Rev. Henry Muhlenberg was especially influential on the Patriot side. His son Peter Muhlenberg, a Lutheran clergyman in Virginia became a major general and later a Congressman. The brief Fries's Rebellion was an anti-tax movement among Germans in Pennsylvania in 1799-1800. "Latin farmer" or Latin Settlement is the designation of several settlements founded by some of the Dreissiger and other refugees from Europe after rebellions like the Frankfurter Wachensturm beginning in the 1830s—predominantly in Texas and Missouri, but also in other US states—in which German intellectuals (freethinkers, German: Freidenker, and Latinists) met together to devote themselves to the German literature, philosophy, science, classical music, and the Latin language. A prominent representative of this generation of immigrants was Gustav Koerner who lived most of the time in Belleville, Illinois until his death. A few German Jews came in the colonial era. The largest numbers arrived after 1820, especially in the mid-19th century. They spread across the North and South (and California, where Levi Strauss arrived in 1853). They formed small German-Jewish communities in cities and towns. They typically were local and regional merchants selling clothing; others were livestock dealers, agricultural commodity traders, bankers, and operators of local businesses. Henry Lehman, who founded Lehman Brothers in Alabama, was a particularly prominent example of such a German-Jewish immigrant. They formed Reform synagogues and sponsored numerous local and national philanthropic organizations, such as B'nai B'rith. This German-speaking group is quite distinct from the Yiddish-speaking East-European Jews who arrived in much larger numbers starting in the late 19th century and concentrated in New York. The port cities of New York, and Baltimore had large populations. As did Hoboken, New Jersey. Cities along the Great Lakes, the Ohio River, and the Mississippi and Missouri Rivers attracted a large German element. The Midwestern cities of Milwaukee, Cincinnati, St. Louis, Chicago were favored destinations of German immigrants. Also, the Northern Kentucky and Louisville area along the Ohio River was a favored destination. By 1900, the populations of the cities of Cleveland, Milwaukee, and Cincinnati were all more than 40% German American. Dubuque and Davenport, Iowa had even larger proportions, as did Omaha, Nebraska, where the proportion of German Americans was 57% in 1910. In many other cities of the Midwest, such as Fort Wayne, Indiana, German Americans were at least 30% of the population. By 1850 there were 5,000 Germans, mostly Schwabians living in, and around, Ann Arbor, Michigan. Many concentrations acquired distinctive names suggesting their heritage, such as the "Over-the-Rhine" district in Cincinnati, "Dutchtown" in South St Louis, and "German Village" in Columbus, Ohio. Whereas half of German immigrants settled in cities, the other half established farms in the Midwest. From Ohio to the Plains states, a heavy presence persists in rural areas into the 21st century. Few German immigrants settled in the Deep South, apart from New Orleans, the German Coast, and Texas. Germans from Russia were the most traditional of German-speaking arrivals. They were Germans who had lived for generations throughout the Russian Empire, but especially along the Volga River in Russia and near the Crimea. Their ancestors had come from all over the German-speaking world, invited by Catherine the Great in 1762 and 1763 to settle and introduce more advanced German agriculture methods to rural Russia. They had been promised by the manifesto of their settlement the ability to practice their respective Christian denominations, retain their culture and language, and retain immunity from conscription for them and their descendants. As time passed, the Russian monarchy gradually eroded the ethnic German population's relative autonomy. Conscription eventually was reinstated; this was especially harmful to the Mennonites, who practice pacifism. Throughout the 19th century, pressure increased from the Russian government to culturally assimilate. Many Germans from Russia found it necessary to emigrate to avoid conscription and preserve their culture. About 100,000 immigrated by 1900, settling primarily in the Dakotas, Kansas and Nebraska. The southern central part of North Dakota was known as "the German-Russian triangle". A smaller number moved farther west, finding employment as ranchers and cowboys. Negatively influenced by the violation of their rights and cultural persecution by the Tsar, the Germans from Russia who settled in the northern Midwest saw themselves a downtrodden ethnic group separate from Russian Americans and having an entirely different experience from the German Americans who had emigrated from German lands; they settled in tight-knit communities that retained their German language and culture. They raised large families, built German-style churches, buried their dead in distinctive cemeteries using cast iron grave markers, and created choir groups that sang German church hymns. Many farmers specialized in sugar beets—still a major crop in the upper Great Plains. During World War I, their identity was challenged by anti-German sentiment. By the end of World War II, the German language, which had always been used with English for public and official matters, was in serious decline. Today, German is preserved mainly through singing groups and recipes, with the Germans from Russia in the northern Great Plains states speaking predominantly English. German remains the second most spoken language in North and South Dakota, and Germans from Russia often use loanwords, such as Kuchen for cake. Despite the loss of their language, the ethnic group remains distinct, and has left a lasting impression on the American West. Musician Lawrence Welk (1903-1992) became an iconic figure in the German-Russian community of the northern Great Plains--his success story personified the American dream. Sentiment among German Americans was largely anti-slavery, especially among Forty-Eighters. Notable Forty-Eighter Hermann Raster wrote passionately against slavery and was very pro-Lincoln. Raster published anti-slavery pamphlets and was the editor of the most influential German language newspaper in America at the time. He helped secure the votes of German-Americans across the United States for Abraham Lincoln. When Raster died the Chicago Tribune published an article regarding his service as a correspondent for America to the German states saying, "His writings during and after the Civil War did more to create understanding and appreciation of the American situation in Germany and to float U.S. bonds in Europe than the combined efforts of all the U.S. ministers and consuls." Hundreds of thousands of German Americans volunteered to fight for the Union in the American Civil War (1861–1865). The Germans were the largest immigrant group to participate in the Civil War; over 176,000 U.S. soldiers were born in Germany. A popular Union commander among Germans, Major General Franz Sigel was the highest-ranking German officer in the Union Army, with many German immigrants claiming to enlist to "fight mit Sigel". Throughout the 19th and 20th centuries, the German Americans showed a high interest in becoming farmers, and keeping their children and grandchildren on the land. While they needed profits to stay in operation, they used profits as a tool "to maintain continuity of the family." They used risk averse strategies, and carefully planned their inheritances to keep the land in the family. Their communities showed smaller average farm size, greater equality, less absentee ownership and greater geographic persistence. As one farmer explained, "To protect your family has turned out to be the same thing as protecting your land." Germany was a large country with many diverse subregions which contributed immigrants. Dubuque was the base of the Ostfriesische Nachrichten ("East Fresian News") from 1881 to 1971. It connected the 20,000 immigrants from East Friesland (Ostfriesland), Germany, to each other across the Midwest, and to their old homeland. In Germany East Friesland was often a topic of ridicule regarding backward rustics, but editor Leupke Hündling shrewdly combined stories of proud memories of Ostfriesland. The editor enlisted a network of local correspondents. By mixing local American and local German news, letters, poetry, fiction, and dialogue, the German-language newspaper allowed immigrants to honor their origins and celebrate their new life as highly prosperous farmers with much larger farms than were possible back in impoverished Ostfriesland. 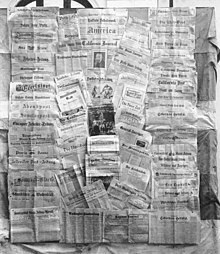 During the world wars, when Germania came under heavy attack, the paper stressed its humanitarian role, mobilizing readers to help the people of East Friesland with relief funds. Younger generations could usually speak German but not read it, so the subscription based dwindled away as the target audience Americanized itself. Relatively few German Americans held office, but the men voted once they became citizens. In general during the Third party System (1850s–1890s), the Protestants and Jews leaned toward the Republican party and the Catholics were strongly Democratic. When prohibition was on the ballot, the Germans voted solidly against it. They strongly distrusted moralistic crusaders, whom they called "Puritans", including the temperance reformers and many Populists. The German community strongly opposed Free Silver, and voted heavily against crusader William Jennings Bryan in 1896. In 1900, however, many German Democrats returned to their party and voted for Bryan, perhaps because of President William McKinley's foreign policy. At the local level, historians have explored the changing voting behavior of the German-American community and one of its major strongholds, St. Louis, Missouri. The German Americans had voted 80 percent for Lincoln in 1860, and strongly supported the war effort. They were a bastion of the Republican Party in St. Louis and nearby immigrant strongholds in Missouri and southern Illinois. The German Americans were angered by a proposed Missouri state constitution that discriminated against Catholics and freethinkers. The requirement of a special loyalty oath for priests and ministers was troublesome. Despite their strong opposition the constitution was ratified in 1865. Racial tensions with the blacks began to emerge, especially in terms of competition for unskilled labor jobs. Germania was nervous about black suffrage in 1868, fearing that blacks would support puritanical laws, especially regarding the prohibition of beer gardens on Sundays. The tensions split off a large German element in 1872, led by Carl Schurz. They supported the Liberal Republican party led by Benjamin Gratz Brown for governor in 1870 and Horace Greeley for president in 1872. Many Germans in late 19th century cities were communists; Germans played a significant role in the labor union movement. A few were anarchists. Eight of the forty-two anarchist defendants in the Haymarket Affair of 1886 in Chicago were German. 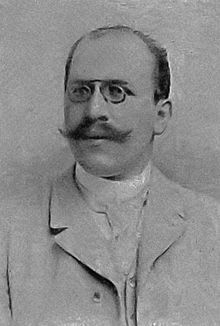 Hugo Münsterberg (1863–1916), a German psychologist, moved to Harvard in the 1890s and became a leader in the new profession. He was president of the American Psychological Association in 1898, and the American Philosophical Association in 1908, and played a major role in many other American and international organizations. Arthur Preuss (1871–1934) was a leading journalist, and theologian. A layman in St Louis. His Fortnightly Review (in English) was a major conservative voice read closely by church leaders and intellectuals from 1894 until 1934. He was intensely loyal to the Vatican. Preuss upheld the German Catholic community, denounced the "Americanism" heresy, promoted the Catholic University of America, and anguished over the anti-German America hysteria during World War I. He provided lengthy commentary regarding the National Catholic Welfare Conference, the anti-Catholic factor in the presidential campaign of 1928, the hardships of the Great Depression, and the liberalism of the New Deal. During World War I (1914–18, American involvement 1917-18), German Americans were often accused of being too sympathetic to Imperial Germany. Former president Theodore Roosevelt denounced "hyphenated Americanism", insisting that dual loyalties were impossible in wartime. A small minority came out for Germany, or ridiculed the British (as did H. L. Mencken). Similarly, Harvard psychology professor Hugo Münsterberg dropped his efforts to mediate between America and Germany, and threw his efforts behind the German cause. The Justice Department prepared a list of all German aliens, counting approximately 480,000 of them, more than 4,000 of whom were imprisoned in 1917–18. The allegations included spying for Germany, or endorsing the German war effort. Thousands were forced to buy war bonds to show their loyalty. The Red Cross barred individuals with German last names from joining in fear of sabotage. One person was killed by a mob; in Collinsville, Illinois, German-born Robert Prager was dragged from jail as a suspected spy and lynched. A Minnesota minister was tarred and feathered when he was overheard praying in German with a dying woman. In Chicago, Frederick Stock temporarily stepped down as conductor of the Chicago Symphony Orchestra until he finalized his naturalization papers. Orchestras replaced music by German composer Wagner with French composer Berlioz. In Cincinnati, the public library was asked to withdraw all German books from its shelves. German-named streets were renamed. The town, Berlin, Michigan, was changed to Marne, Michigan (honoring those who fought in the Battle of Marne). In Iowa, in the 1918 Babel Proclamation, the governor prohibited all foreign languages in schools and public places. Nebraska banned instruction in any language except English, but the U.S. Supreme Court ruled the ban illegal in 1923 (Meyer v. Nebraska). The response of German Americans to these tactics was often to "Americanize" names (e.g., Schmidt to Smith, Müller to Miller) and limit the use of the German language in public places, especially churches. German-American farmer John Meints of Minnesota was tarred and feathered in August 1918 for allegedly not supporting war bond drives. 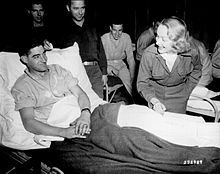 Marlene Dietrich signing a soldier's cast (Belgium, 1944). Between 1931 and 1940, 114,000 Germans moved to the United States, many of whom—including Nobel prize winner Albert Einstein and author Erich Maria Remarque—were Jewish Germans or anti-Nazis fleeing government oppression. About 25,000 people became paying members of the pro-Nazi German American Bund during the years before the war. German aliens were the subject of suspicion and discrimination during the war, although prejudice and sheer numbers meant they suffered as a group generally less than Japanese Americans. The Alien Registration Act of 1940 required 300,000 German-born resident aliens who had German citizenship to register with the Federal government and restricted their travel and property ownership rights. Under the still active Alien Enemy Act of 1798, the United States government interned nearly 11,000 German citizens between 1940 and 1948. Civil rights violations occurred. An unknown number of "voluntary internees" joined their spouses and parents in the camps and were not permitted to leave. President Franklin D. Roosevelt sought out Americans of German ancestry for top war jobs, including General Dwight D. Eisenhower, Admiral Chester W. Nimitz, and USAAF General Carl Andrew Spaatz. He appointed Republican Wendell Willkie (who ironically ran against Roosevelt in the 1940 presidential election) as a personal representative. German Americans who had fluent German language skills were an important asset to wartime intelligence, and they served as translators and as spies for the United States. The war evoked strong pro-American patriotic sentiments among German Americans, few of whom by then had contacts with distant relatives in the old country. In the aftermath of World War II, millions of ethnic Germans were forcibly expelled from their homes within the redrawn borders of Central and Eastern Europe, including the Soviet Union, Poland, Czechoslovakia, Romania, Hungary and Yugoslavia. Most resettled in Germany, but others came as refugees to the United States in the late 1940s, and established cultural centers in their new homes. Some Danube Swabians, for instance, ethnic Germans who had maintained language and customs after settlement along the Danube in Hungary, later Yugoslavia (now Serbia), immigrated to the U.S. after the war. The Economist magazine in 2015 interviewed Petra Schürmann, the director of the German-American Heritage Museum in Washington for a major article on German-Americans. She notes that all over the United States, celebrations such as German fests and Oktoberfests have been appearing. States with the highest proportions of German Americans tend to be those of the upper Midwest, including Iowa, Minnesota, Nebraska, Wisconsin, and the Dakotas; all at over one-third. The spiritual beliefs of Johann Conrad Beissel (1690–1768) and the Ephrata Cloister—such as the asceticism and mysticism of this Lancaster County, Pennsylvania, group - are reflected in Beissel's treatises on music and hymns, which have been considered the beginning of America's musical heritage. A small city, Wheeling, West Virginia could boast of 11 singing societies—Maennerchor, Harmonie, Liedertafel, Beethoven, Concordia, Liederkranz, Germania, Teutonia, Harmonie-Maennerchor, Arion, and Mozart. The first began in 1855; the last folded in 1961. An important aspect of Wheeling social life, these societies reflected various social classes and enjoyed great popularity until anti-German sentiments during World War I and changing social values dealt them a death blow. The Imperial government in Berlin promoted German culture in the U.S., especially music. A steady influx of German-born conductors, including Arthur Nikisch and Karl Muck, spurred the reception of German music in the United States, while German musicians seized on Victorian Americans' growing concern with 'emotion'. The performance of pieces such as Beethoven's Ninth Symphony established German serious music as the superior language of feeling. By the end of the 19th century, there were over 800 German-language publications in the United States. German immigration was on the decline, however, and with subsequent generations integrating into English-speaking society, the German language press began to struggle. The periodicals that managed to survive in immigrant communities faced an additional challenge with anti-German sentiment during World War I and with the Espionage and Sedition Acts, which authorized censorship of foreign language newspapers. Prohibition also had a destabilizing impact on the German immigrant communities upon which the German-language publications relied. By 1920, there were only 278 German language publications remaining in the country. After 1945, only a few publications have been started. One example is Hiwwe wie Driwwe (Kutztown, PA), the nation's only Pennsylvania German newspaper, which was established in 1997. This 1850 census map shows the Lutheran population. Nearly all were German, since few Scandinavians had arrived yet. German immigrants who arrived before the 19th century tended to have been members of the Evangelical Lutheran Churches in Germany, and created the Lutheran Synods of Pennsylvania, North Carolina and New York. The largest Lutheran denominations in the U.S. today—the Evangelical Lutheran Church in America, the Lutheran Church–Missouri Synod, and the Wisconsin Evangelical Lutheran Synod—are all descended from churches started by German immigrants among others. Calvinist Germans founded the Reformed Church in the United States (especially in New York and Pennsylvania), and the Evangelical Synod of North America (strongest in the Midwest), which is now part of the United Church of Christ. Many immigrants joined different churches from those that existed in Germany. Protestants often joined the Methodist church. In the 1740s, Count Nicolas von Zinzendorf tried to unite all the German-speaking Christians—(Lutheran, Reformed, and Separatists)—into one "Church of God in the Spirit". The Moravian Church in America is one of the results of this effort, as are the many "Union" churches in rural Pennsylvania. Before 1800, communities of Amish, Mennonites, Schwarzenau Brethren and Moravians had formed and are still in existence today. The Old Order Amish and a majority of the Old Order Mennonites still speak dialects of German, including Pennsylvania German, informally known as Pennsylvania Dutch. The Amish, who were originally from southern Germany and Switzerland, arrived in Pennsylvania during the early 18th century. Amish immigration to the United States reached its peak between the years 1727 and 1770. Religious freedom was perhaps the most pressing cause for Amish immigration to Pennsylvania, which became known as a haven for persecuted religious groups. The Hutterites are another example of a group of German Americans who continue a lifestyle similar to that of their ancestors. Like the Amish, they fled persecution for their religious beliefs, and came to the United States between 1874 and 1879. Today, Hutterites mostly reside in Montana, the Dakotas, and Minnesota, and the western provinces of Canada. Hutterites continue to speak Hutterite German. Most are able to understand Standard German in addition to their dialect. The German speaking "Russian" Mennonites migrated during the same time as the Hutterites, but assimilated relatively quickly in the United States, whereas groups of "Russian" Mennonites in Canada resisted assimilation. Immigrants from Germany in the mid-to-late-19th century brought many different religions with them. The most numerous were Lutheran or Catholic, although the Lutherans were themselves split among different groups. The more conservative Lutherans comprised the Lutheran Church–Missouri Synod and the Wisconsin Evangelical Lutheran Synod. Other Lutherans formed various synods, most of which merged with Scandinavian-based synods in 1988, forming the Evangelical Lutheran Church in America. Catholic Germans started immigrating in large numbers in the mid to latter 19th century, spurred in particular by the Kulturkampf. Some 19th-century immigrants, especially the "Forty-Eighters", were secular, rejecting formal religion. About 250,000 German Jews had arrived by the 1870s, and they sponsored reform synagogues in many small cities across the country. About 2 million Central and Eastern European Jews arrived from the 1880s to 1924, bringing more traditional religious practices. After two or three generations, most German Americans adopted mainstream American customs — some of which they heavily influenced — and switched their language to English. As one scholar concludes, "The overwhelming evidence ... indicates that the German-American school was a bilingual one much (perhaps a whole generation or more) earlier than 1917, and that the majority of the pupils may have been English-dominant bilinguals from the early 1880s on." By 1914, the older members attended German-language church services, while younger ones attended English services (in Lutheran, Evangelical and Catholic churches). In German parochial schools, the children spoke English among themselves, though some of their classes were in German. In 1917–18, after the US entry into World War I on the side of the British, nearly all German language instruction ended, as did most German-language church services. About 1.5 million Americans speak German at home, according to the 2000 census. From 1860–1917, German was widely spoken in German neighborhoods; see German in the United States. There is a false belief, called the Muhlenberg legend, that German was almost the official language of the U.S. There was never any such proposal. The U.S. has no official language, but use of German was strongly discouraged during World War I and fell out of daily use in many places. "Assimilation" in this context means the steady loss of distinctive characteristics (especially language), as the Germans melted into a common American nationality. The transition to the English language was abrupt, forced by federal, state and local governments, and by public opinion, when the U.S. was at war with Germany in 1917-18. After 1917 the German language was seldom heard in public; most newspapers and magazines closed; churches and parochial schools switched to English. Melvin G. Holli states that "In 1917 the Missouri Synod's Lutheran Church conference minutes appeared in English for the first time, and the synod's new constitution dropped its insistence on using the language of Luther only and instead suggested bilingualism. Dozens of Lutheran schools also dropped instruction in the German language. English-language services also intruded themselves into parishes where German had been the lingua franca. Whereas only 471 congregations nationwide held English services in 1910, the number preaching in the tongue of Albion in the synod skyrocketed to 2,492 by 1919. The German Evangelical Synod of Missouri, Ohio, and other states also anglicized its name by dropping German from the title". :106 Writing about Fort Wayne, Indiana, Cynthia Moothart O'Bannon states that, in the First World War, "Local churches were forced to discontinue sermons in German, schools were pressured to stop teaching in German, and the local library director was ordered to purchase no more books written in German. The library shelves also were purged of English-language materials deemed sympathetic to or neutral on Germany. Anti-German sentiment forced the renaming of several local institutions. Teutonia Building, Loan & Savings became Home Loan & Savings, and The German-American bank became Lincoln National Bank & Trust Co." She continues that "in perhaps the most obvious bend to prevailing trends, Berghoff Brewery changed its motto from "A very German brew" to "A very good brew," according to "Fort Wayne: A Most German Town," a documentary produced by local public television station WFWA, Channel 39". Film critic Roger Ebert wrote how "I could hear the pain in my German-American father's voice as he recalled being yanked out of Lutheran school during World War I and forbidden by his immigrant parents ever to speak German again". Melvin G. Holli states, regarding Chicago, that "After the Great War it became clear that no ethnic group was so de-ethnicized in its public expression by a single historic event as German Americans. While Polish Americans, Lithuanian Americans, and other subject nationalities underwent a great consciousness raising, German ethnicity fell into a protracted and permanent slump. The war damaged public expression of German ethnic, linguistic, and cultural institutions almost beyond repair". :106 He states that, after the war, German ethnicity "would never regain its prewar public acclaim, its larger-than-life public presence, with its symbols, rituals, and, above all, its large numbers of people who took pride in their Teutonic ancestry and enjoyed the role of Uncle Sam's favored adopted son". :107 He states "A key indicator of the decline of "Deutschtum" in Chicago was the census: the number identifying themselves to the census-taker as German-born plummeted from 191,000 in 1910 to 112,000 in 1920. This drop far exceeds the natural mortality rate or the number who might be expected to move. Self-identifiers had found it prudent to claim some nationality other than German. To claim German nationality had become too painful an experience". :106 Along similar lines, Terrence G. Wiley states that, in Nebraska, "around 14 percent of the population had identified itself as being of German-origin in 1910; however, only 4.4 percent made comparable assertions in 1920. In Wisconsin, the decline in percentage of those identifying themselves as Germans was even more obvious. The 1920 census reported only 6.6. percent of the population as being of German-origin, as opposed to nearly 29 percent ten years earlier ... These statistics led Burnell ... to conclude that: "No other North American ethnic group, past or present, has attempted so forcefully to officially conceal their ... ethnic origins. One must attribute this reaction to the wave of repression that swept the Continent and enveloped anyone with a German past"". The Catholic high schools were deliberately structured to commingle ethnic groups so as to promote ethnic (but not interreligious) intermarriage. German-speaking taverns, beer gardens and saloons were all shut down by prohibition; those that reopened in 1933 spoke English. While its impact appears to be less well-known and studied than the impact which World War One had on German Americans, World War Two was likewise difficult for them and likewise had the impact of forcing them to drop distinctive German characteristics and assimilate into the general US culture. According to Melvin G. Holli, "By 1930, some German American leaders in Chicago felt, as Dr. Leslie Tischauser put it, "the damage done by the wartime experience had been largely repaired." The German language was being taught in the schools again; the German theater still survived; and German Day celebrations were drawing larger and larger crowds. Although the assimilation process had taken its toll of pre-1914 German immigrants, a smaller group of newer postwar arrivals had developed a vocal if not impolitic interest in the rebuilding process in Germany under National Socialism. As the 1930s moved on, Hitler's brutality and Nazi excesses made Germanism once again suspect. The rise of Nazism, as Luebke notes, "transformed German ethnicity in America into a source of social and psychological discomfort, if not distress. The overt expression of German-American opinion consequently declined, and in more recent years, virtually disappeared as a reliable index of political attitudes. . . ."":108 Holli goes on to state that "The pain increased during the late 1930s and early 1940s, when Congressman Martin Dies held public hearings about the menace of Nazi subversives and spies among the German Americans. In 1940 the Democratic party's attack on anti-war elements as disloyal and pro-Nazi, and the advent of the war itself, made German ethnicity too heavy a burden to bear. As Professor Tischauser wrote, "The notoriety gained by those who supported the German government between 1933 and 1941 cast a pall over German-Americans everywhere. Leaders of the German-American community would have great difficulty rebuilding an ethnic consciousness. . . . Few German-Americans, however, could defend what Hitler . . . had done to millions of people in pursuit of the 'final solution,' and the wisest course for German-Americans was to forget any attachment to the German half of their heritage. "":108 - 109 Jennifer Hansler has stated that "Fred Trump sought to pass himself off as Swedish amid anti-German sentiment sparked by World War II"; Donald reaffirmed this myth in The Art of the Deal. Historians have tried to explain what became of the German Americans and their descendants. Kazal (2004) looks at Germans in Philadelphia, focusing on four ethnic subcultures: middle-class Vereinsdeutsche, working-class socialists, Lutherans, and Catholics. Each group followed a somewhat distinctive path toward assimilation. Lutherans, and the better situated Vereinsdeutsche with whom they often overlapped, after World War I abandoned the last major German characteristics and redefined themselves as old stock or as "Nordic" Americans, stressing their colonial roots in Pennsylvania and distancing themselves from more recent immigrants. On the other hand, working-class and Catholic Germans, groups that heavily overlapped, lived and worked with Irish and other European ethnics; they also gave up German characteristics but came to identify themselves as white ethnics, distancing themselves above all from African American recent arrivals in nearby neighborhoods. Well before World War I, women in particular were becoming more and more involved in a mass consumer culture that lured them out of their German-language neighborhood shops and into English language downtown department stores. The 1920s and 1930s brought English language popular culture via movies and radio that drowned out the few surviving German language venues. Kazal points out that German Americans have not had an experience that is especially typical of immigrant groups. "Certainly, in a number of ways, the German-American experience was idiosyncratic. No other large immigrant group was subjected to such strong, sustained pressure to abandon its ethnic identity for an American one. None was so divided internally, a characteristic that made German Americans especially vulnerable to such pressure. Among the larger groups that immigrated in the country after 1830, none - despite regional variations - appears to have muted its ethnic identity to so great an extent. ":273 This quote from Kazal identifies both external pressures on German Americans and internal dividedness among them as reasons for their high level of assimilation. Despite the remarkable level of assimilation reached by German Americans, it is worth noting that a distinct German American ethnicity survived well into the mid/late-20th century in some places. Writing about the town of Hustisford, Wisconsin, Jennifer Ludden discusses Mel Grulke, who was born in 1941, with German his first language at home; "Grulke's great-grandparents immigrated to the U.S. in the late 1880s, yet three generations later, his farmer parents still spoke German at home, attended German language church services and chatted in German with shopkeepers when they brought their farm eggs into town to sell". Bethany Lutheran Church in Hustisford offered German-language services into the 1970s; Zum Kripplein Christi, in the same county as Hustisford (Dodge County), "offered a Sunday service in German as recently as the 1990s"; St. Luke Lutheran Church, in Wishek, North Dakota, still held German-language services until as recently as about 1994; St. Matthew's Lutheran Church in San Francisco still holds German-language services to this day. Homer Rudolf, a man from North Dakota of German Russian descent, stated in 2004 that his maternal grandmother, who died in 1980 at the age of 90, "did not learn English". As recently as 1990, one quarter of North Dakota's households included a German speaker. To this day, relatively unassimilated people of German-speaking heritage can be found in the United States among different Anabaptist groups - the Old Order Amish and most Old Order Mennonites speak Pennsylvania Dutch (or Bernese German or Alsatian by a minority of Amish) along with High German to various degrees (though they are generally fluent in English). All Hutterites speak Hutterite German and many "Russian" Mennonites speak Plautdietsch, a German dialect coming originally from the area around Danzig. The three Amish dialects as well as Hutterite German are still learned by all children of the group, whereas Plautdietsch-speakers tend much more to assimilate. Another group of relatively unassimilated people of German-speaking heritage can be found in the Amana Colonies in Iowa; according to the website Statistical Atlas, all of the residents of East Amana speak German at home, and only 67.7% can speak English 'Very Well'. It has been shown that cultural differences between the attitudes towards farming of German Americans, on the one hand, and of British-ancestry Yankees, on the other, lasted into the 1980s and have to some extend lasted into the 21st century; German Americans have tended to see farming in a more family-oriented manner than Yankees. Germans have contributed to a vast number of areas in American culture and technology. Baron von Steuben, a former Prussian officer, led the reorganization of the U.S. Army during the War for Independence and helped make the victory against British troops possible. 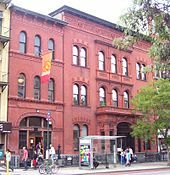 The Steinway & Sons piano manufacturing firm was founded by immigrant Henry E. Steinway in 1853. German settlers brought the Christmas tree custom and other German Christmas traditions to the United States. The Studebakers built large numbers of wagons used during the Western migration; Studebaker, like the Duesenberg brothers, later became an important early automobile manufacturer. Carl Schurz, a refugee from the unsuccessful first German democratic revolution of 1848 became an influential politician first in the Republican then in the Democratic party, and served as U.S. Secretary of the Interior. After World War II, Wernher von Braun, and most of the leading engineers from the former German V-2 rocket base at Peenemünde, were brought to the U.S. They contributed decisively to the development of U.S. military rockets, as well as rockets for the NASA space program and the initiation of the Apollo program to land on the Moon. Similarly, fellow German aviation technologist Siegfried Knemeyer, the former top aviation technologist within Reichsmarschall Hermann Göring's Reich Air Ministry during World War II, was brought to the United States through a similar path to von Braun, and served as a civilian employee of the USAF for over twenty years. The influence of German cuisine is seen in the cuisine of the United States throughout the country, especially regarding pastries, meats and sausages, and above all, beer. Frankfurters (or "wieners", originating from Frankfurt am Main and Vienna, respectively), hamburgers, bratwurst, sauerkraut, and strudel are common dishes. German bakers introduced the pretzel, which is popular across the United States. Germans introduced America to lager, the most-produced beer style in the United States, and have been the dominant ethnic group in the beer industry since 1850. The oldest extant brewery in the United States is D. G. Yuengling & Son of Pottsville, Pennsylvania (approximately 80 miles northwest of Philadelphia), founded in 1829 by an immigrant from Aldingen in what is today Baden-Württemberg; the brewery's flagship product remains a 19th-century German-style amber lager. By the late 19th century, Milwaukee, with a large population of German origin, was once the home to four of the world's largest breweries owned by ethnic Germans (Schlitz, Blatz, Pabst, and Miller) and was the number one beer producing city in the world for many years. Almost half of all current beer sales in the United States can be attributed to German immigrants, Capt. A. Pabst, Eberhard Anheuser, and Adolphus Busch, who founded Anheuser-Busch in St. Louis in 1860. Later German immigrants figured prominently in the rebirth of craft brews following Prohibition, culminating in the microbrew movement that swept the U.S. beginning in the late 1980s. German and German-American celebrations, such as Oktoberfest, Rhenish Carnival, German-American Day and Von Steuben Day are held regularly throughout the country. One of the largest is the German-American Steuben Parade in New York City, held every third Saturday in September. There are also major annual events in Chicago's Lincoln Square neighborhood, a traditional a center of the city's German population, in Cincinnati, where its annual Oktoberfest Zinzinnati is the largest Oktoberfest outside of Germany and in Milwaukee, which celebrates its German heritage with an annual German Fest. Many of the immigrants from Germany and other German-speaking countries came to Pennsylvania to what was then "Allegheny City" (now part of the North Side of the City of Pittsburgh). So many German speakers arrived, the area became known as "Deutschtown" and has been revived as such. Within Deutschtown and since 1854, The Teutonia Männerchor has been promoting and furthering German cultural traditions. For a more comprehensive list, see List of German Americans. German Americans have been influential in almost every field in American society, including science, architecture, business, sports, entertainment, theology, politics, and the military. Many of these individuals were of German Jewish descent or anti-Nazis who fled Nazi oppression. German American general/flag military officers Baron von Steuben, George Armstrong Custer, John Pershing, Dwight D. Eisenhower, Chester W. Nimitz, Carl Andrew Spaatz and Norman Schwarzkopf commanded the United States Army in the American Revolutionary War, American Civil War, Indian Wars, World War I, World War II, and the Persian Gulf War, respectively. German Americans were famous American politicians, including Carl Schurz, Friedrich Hecker, Frederick Muhlenberg, Henry Morgenthau, Sr., Henry Morgenthau, Jr., Dwight D. Eisenhower, Herbert Hoover, Henry Kissinger, John Boehner and Donald Trump. Many German Americans have played a prominent role in American industry and business, including Henry J. Heinz (H. J. Heinz Company), Frank Seiberling (Goodyear Tire and Rubber Company), Walt Disney (Disney), John D. Rockefeller (Standard Oil), William Boeing (The Boeing Company) and (United Airlines), Walter Chrysler (Chrysler Corporation), Frederick and August Duesenberg (Duesenberg Automobile Corporation), Studebaker brothers (Studebaker Automobile Corporation), George Westinghouse (Westinghouse Electric Corporation), Levi Strauss (Levi Strauss & Co.), Charles Guth (PepsiCo Inc.), Bill Gates (Microsoft Corporation), Jawed Karim (YouTube), Elon Musk (SolarCity), (SpaceX) and (Tesla Motors), James L. Kraft (Kraft Foods Inc.), Henry E. Steinway (Steinway & Sons), Charles Pfizer (Pfizer, Inc.), John Jacob Astor (Waldorf Astoria Hotels and Resorts), Conrad Hilton (Hilton Hotels & Resorts), Guggenheim family (Solomon R. Guggenheim Foundation), (Guggenheim Partners), Marcus Goldman and Samuel Sachs (The Goldman Sachs Group, Inc.), Lehman Brothers (Lehman Brothers Holdings Inc.), Carl Laemmle (Universal Studios), Marcus Loew (Metro-Goldwyn-Mayer Studios Inc.), Harry Cohn (Columbia Pictures Industries, Inc.), Herman Hollerith (International Business Machines Corporation (IBM)), Steve Jobs (Apple Inc.), Michael Dell (Dell Inc.), Eric Schmidt (Google Inc.) and (Alphabet Inc.), Peter Thiel (PayPal Inc.), Adolph Simon Ochs and Arthur Ochs Sulzberger (The New York Times), Charles Bergstresser (The Wall Street Journal), Al Neuharth (USA Today), Eugene Meyer (The Washington Post) etc. German Americans were pioneers and dominated beer brewing for much of American history, beginning with breweries founded in the 19th century by German immigrants August Schell (August Schell Brewing Company), Christian Moerlein (Christian Moerlein Brewing Co.), Eberhard Anheuser (Anheuser-Busch InBev), Adolphus Busch (Anheuser-Busch InBev), Adolph Coors (Molson Coors Brewing Company), Frederick Miller (Miller Brewing Company), Frederick Pabst (Pabst Brewing Company), Bernhard Stroh (Stroh Brewery Company) and Joseph Schlitz (Joseph Schlitz Brewing Company). Others, including Albert Einstein, J. Robert Oppenheimer, Wernher von Braun, John Peter Zenger, John Steinbeck, Kurt Vonnegut, Joseph Weizenbaum set intellectual landmarks while Neil Armstrong was the first human to land on the moon. Still others, such as Bruce Willis, George Eyser, Babe Ruth, Lou Gehrig, Jack Nicklaus, Dale Earnhardt, Doris Mary Ann Kappelhoff (Doris Day), Grace Kelly, Clark Gable, Marlene Dietrich, Johnny Weissmuller, Ernst Lubitsch, Walter Damrosch, Henry John Deutschendorf (John Denver), John Kay, Heidi Klum, Meryl Streep, Marlon Brando, Kim Basinger, Sandra Bullock, David Hasselhoff, Leonardo DiCaprio, Kirsten Dunst, and Kevin George Knipfing (Kevin James) became prominent athletes, actors, film directors or artists. There have been three presidents whose fathers were of German descent: Dwight D. Eisenhower (original family name Eisenhauer and maternal side is also German/Swiss), Herbert Hoover (original family name Huber), and Donald Trump (whose paternal grandparents were immigrants from the Palatinate region of Germany). Presidents with maternal German ancestry include Richard Milhous Nixon (Nixon's maternal ancestors were Germans who anglicized Melhausen to Milhous) and Barack Obama, whose maternal family's ancestry includes German immigrants from the South German town of Besigheim and from Bischwiller in the Alsace region that is nowadays part of France; both families came to America around 1750. ^ a b "People reporting ancestry". 2016 American Community Survey 1-Year Estimates. US Census Bureau. Archived from the original on 2016-10-19. Retrieved 8 July 2016. Margin of error is +/-117,093. 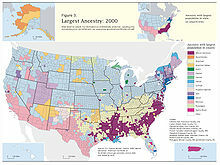 ^ "6 Maps That Show How Ethnic Groups Are Divided Across America". 2013-09-08. Retrieved 2016-03-10. ^ "The Germans in America". 2014-04-24. Retrieved 2015-06-12. ^ "Ancestry of the Population by State: 1980 - Table 3" (PDF). Retrieved 2012-11-11. ^ Germans and foreigners with an immigrant background Archived May 4, 2009, at the Wayback Machine. 156 is the estimate which counts all people claiming ethnic German ancestry in the U.S., Brazil, Argentina, and elsewhere. ^ "Report on German population". Histclo.com. 4 February 2010. Retrieved 2013-01-07. ^ Robert C. Nesbit (2004). Wisconsin: A History. University of Wisconsin Press. pp. 155–57. ISBN 9780299108045. ^ Harvard Office of News and Public Affairs. "Professor Brought Christmas Tree to New England". News.harvard.edu. Retrieved 17 March 2015. ^ Paul Kleppner, The Third Electoral System, 1853-1892: Parties, Voters, and Political Cultures (1979) pp 147-58 maps out the political beliefs of key subgroups. ^ Richardson, Belinda (2007). Christian Clergy Response to Intimate Partner Violence: Attitudes, Training, Or Religious Views?. ProQuest. p. 55. ISBN 9780549564379. ^ Michael A. Lerner (2009). Dry Manhattan: Prohibition in New York City. Harvard UP. pp. 31–32. ISBN 9780674040090. ^ Rose, Kenneth D. (1997). American Women and the Repeal of Prohibition. NYU Press. pp. 34–35. ISBN 9780814774663. ^ Philip R. VanderMeer, "Religion, society, and politics: a classification of American religious groups." Social Science History (1981): 3-24 in JSTOR. ^ "Loyalists (Royalists, Tories) in South Carolina". Sciway3.net. Retrieved 17 March 2015. ^ Hostetler, John A. (1993). Amish Society. Baltimore: The Johns Hopkins University Press. p. 241. ^ De Grauwe, Luc, "Emerging mother-tongues awareness in Dutch and German". In Linn & McLelland (eds). Standardization: Studies from the Germanic Languages. p. 101, 104, passim. ^ Don Heinrich Tolzmann, ed. ; German Americans in the Revolution: Henry Melchoir Muhlenberg Richards' History (2013, based on 1908 history). ^ Theodore G. Tappert, "Henry Melchior Muhlenberg and the American Revolution." Church History 11.4 (1942): 284-301. online. ^ "Where and when was the first German Immigration?". prezi.com. ^ Naomi Wiener Cohen, Encounter with Emancipation: The German Jews in the United States, 1830-1914 (Varda Books, 2001). ^ Zev Eleff, Who Rules the Synagogue? : Religious Authority and the Formation of American Judaism (Oxford Up, 2016). ^ Cornelia Wilhelm, The Independent Orders of B'nai B'rith and True Sisters: Pioneers of a New Jewish Identity, 1843-1914 (2011). ^ Stephenson, Orlando (1927). Ann Arbor the First Hundred Years (Hardcover). Ann Arbor: Ann Arbor Chamber of Commerce. p. 81. Retrieved 25 February 2016. ^ Elwyn B. Robinson, History of North Dakota (1966) pp. 285–87, 557; Gordon L. Iseminger, "Are We Germans, or Russians, or Americans? The McIntosh County German-Russians During World War I", North Dakota History 1992 59(2): 2–16. ^ "Inventory of the Hermann Raster Papers". The Newberry Library. ^ "Honor Herman Raster." Chicago Tribune 12 August 1891: 2. Print. ^ a b Christian B. Keller, "Flying Dutchmen and Drunken Irishmen: The Myths and Realities of Ethnic Civil War Soldiers", Journal of Military History, Vol/ 73, No. 1, January 2009, pp. 117–145; for primary sources see Walter D. Kamphoefner and Wolfgang Helbich, eds., Germans in the Civil War: The Letters They Wrote Home (2006). ^ Richard J. Jensen (1971). The Winning of the Midwest: Social and Political Conflict, 1888-1896. Richard Jensen. p. 292. ISBN 978-0-226-39825-9. ^ Dorothee Schneider (1994). Trade Unions and Community: The German Working Class in New York City, 1870-1900. p. 36. ISBN 9780252020575. ^ Hartmut Keil, and John B. Jentz, eds., German Workers in Industrial Chicago, 1850-1910: A Comparative Perspective (1983). ^ Goyens, Tom. "Beer and Revolution: Some Aspects of German Anarchist Culture in New York, 1880–1900". Social Anarchism journal. Retrieved 8 July 2012. ^ Jutta Spillmann, and Lothar Spillmann. "The rise and fall of Hugo Münsterberg." Journal of the History of the Behavioral Sciences 29#4 (1993): 322-338. ^ Rory T. Conley, Arthur Preuss: Journalist and Voice of German and Conservative Catholics in America, 1871-1934 (1998). ^ Jutta Spillmann and Lothar Spillmann. "The rise and fall of Hugo Münsterberg." Journal of the History of the Behavioral Sciences 29.4 (1993) 322-338. ^ "Untitled Document". Earlham.edu. Retrieved 28 August 2017. ^ The War Department: Keeper of Our Nation's Enemy Aliens During World War I by Mitchell Yockelson. Presented to the Society for Military History Annual Meeting, April 1998. ^ "Cincinnati's Century of Change - May". Enquirer.com. Retrieved 17 March 2015. ^ "Text of H.R. 3198 (109th): Wartime Treatment Study Act (Introduced version) - GovTrack.us". GovTrack.us. Retrieved 17 March 2015. ^ "German American Internee Coalition". Archived from the original on 5 March 2015. Retrieved 17 March 2015. ^ "German Internment Camps in World War II (thing)". Everything2.com. Retrieved 17 March 2015. ^ "BBC NEWS - Americas - The lost voices of Crystal City". News.bbc.co.uk. 2004-04-08. Retrieved 17 March 2015. ^ "German Internees Time Line". Traces.org. Archived from the original on 21 March 2015. Retrieved 17 March 2015. ^ "Wartime Policies". Traces.org. Archived from the original on 25 March 2015. Retrieved 17 March 2015. ^ "German Missions in the United States - Home". Germany.info. Archived from the original on 4 September 2008. Retrieved 17 March 2015. ^ "Teacher Resources - Library of Congress". Rs6.loc.gov. Retrieved 17 March 2015. ^ "Chronology : The Germans in America (European Reading Room, Library of Congress)". Loc.gov. Retrieved 17 March 2015. ^ "City & County Information, Town & Community Information". ePodunk. Retrieved 2014-08-10. ^ "Top 101 cities with the most residents born in Germany (population 500+)". city-data.com. Advameg, Inc. 2012. Retrieved May 11, 2012. ^ Murdoch, Adrian (1 December 2012). Rome's Greatest Defeat: Massacre in the Teutoburg Forest. The History Press. ISBN 0752494554. ^ "Deutsch-Athen Revisited…". Uwm.edu. Archived from the original on 7 December 2008. Retrieved 28 August 2017. ^ Donald B. Kraybill and Nelson Hostetter: Anabaptist World USA, 2001, Scottdale, PA, and Waterloo, ON, page 115. ^ Edward S. Shapiro, "Jews", in Elliott Barkan, ed. A Nation of Peoples (1999) 330–36. ^ "Detailed Language Spoken at Home and Ability to Speak English for Persons 5 Years and Over --50 Languages with Greatest Number of Speakers: United States 1990". United States Census Bureau. 1990. Retrieved July 22, 2012. ^ "Language Use in the United States:2007" (PDF). United States Bureau of the Census. Retrieved June 24, 2014. ^ "Language loyalty in the German-American Church: the Case of an Over-confident Minority". Ccat.sas.upenn.edu. Retrieved 17 March 2015. ^ "The silent minority". The Economist. 5 February 2015 – via The Economist. ^ a b c d e f g h i j k l Holli, Melvin G. (1995). "German American Ethnic and Cultural Identity from 1890 Onward". In Holli, Melvin G.; Jones, Peter d'A. Ethnic Chicago: A Multicultural Portrait. William B. Eerdmans Publishing Company. ^ Leslie, W. Bruce (1997). "German Americans". In Parish, Peter J. Reader's Guide to American History. Fitzroy Dearborn Publishers. ISBN 9781134261895. ^ a b c d e f g Ludden, Jennifer (April 1, 2009). "German". National Public Radio. Retrieved December 23, 2012. ^ a b c d e Moothart O'Bannon, Cynthia. "WWI altered the German accent of Allen County". fortwayne.com. ^ Ebert, Roger (April 12, 2002). ""I could hear the pain in my German-American father's voice"". Chicago Sun-Times. Retrieved December 23, 2012. ^ Wiley, Terrence G. (1998). "What Happens After English is Declared the Official Language of the United States?". In Kibbee, Douglas A. Language Legislation and Linguistic Rights. John Benjamins Publishing Company. ^ a b Hansler, Jennifer (28 November 2017). "Trump's family denied German heritage for years". CNN. ^ Carlström, Vilhelm (28 November 2017). "Donald Trump claimed he was of Swedish ancestry - but it's a lie". Business Insider. ^ Horowitz, Jason (21 August 2016). "For Donald Trump's Family, an Immigrant's Tale With 2 Beginnings". New York Times. ^ a b c d e f g h i j k l Russell A. Kazal, Becoming Old Stock: The Paradox of German-American Identity (2004). ^ a b Waters, Mary C. (1990). Ethnic Options: Choosing Identities in America. University of California Press. ISBN 9780520070837. ^ a b c Peterson, David (1992). ""From Bone Depth": German-American Communities in Rural Minnesota before the Great War on JSTOR". Journal of American Ethnic History. 11 (2): 27–55. JSTOR 27500930. ^ "Encyclopedia of the Great Plains - GERMANS". plainshumanities.unl.edu. ^ a b Baker, Jason Todd (2008). "Pulitzer, Preetorius, and the German American Identity Project of the Westliche Post in St. Louis". In Schulze, Mathias; Skidmore, James M.; John, David G.; Liebscher, Grit; Siebel-Achenbach, Sebastian. German Diasporic Experiences: Identity, Migration and Loss. Wilfrid Laurier University Press. ^ a b "How German Is American? Building Communities - Max Kade Institute". mki.wisc.edu. ^ Cayton, Andrew R. L. (2002). Ohio: The History of a People. The Ohio State University Press. ISBN 9780814208991. ^ a b c Miller, Randall M. (1988). "Immigration through New Orleans: A Comment". In Stolarik, M. Mark. Forgotten Doors: The Other Ports of Entry to the United States. Associated University Presses. ^ "Germans from Russia Heritage Collection". library.ndsu.edu. ^ "Germans American History in San Francisco". www.germanamericanpioneers.org. ^ "About Us". St. Matthews Lutheran Church. ^ "Germans from Russia Heritage Collection". Library.ndsu.edu. September 18, 2004. Retrieved April 18, 2013. ^ Brooke, James (2 March 1996). "North Dakota, With German Roots, Adopts Spanish as Second Language". NYTimes.com. Retrieved 28 August 2017. ^ Skutsch, Carl (2005). Encyclopedia of the World's Minorities. Routledge. p. 101. ^ Fischer, Claude S. (May 4, 2015). "Family Farms vs. Americanism". Boston Review. Retrieved January 31, 2019. ^ BeerHistory.com. "Yuengling of Pottsville: America's Oldest Brewery". Retrieved December 8, 2006. ^ "Oktoberfest Zinzinnati". Oktoberfest-zinzinnati.com. Archived from the original on 2011-02-07. Retrieved 28 August 2017. ^ "About Oktoberfest - Oktoberfest Zinzinnati". Oktoberfestzinzinnati.com. Retrieved 28 August 2017. ^ "Archived copy". Archived from the original on 2012-01-17. Retrieved 2012-01-14. CS1 maint: Archived copy as title (link)"'About the Teutonia Männerchor' -- THE EARLY 1800s – Around the early and the mid-1800s and through the end of the 20th century, there was a mass immigration from all across Europe to the United States. Many of the immigrants from Germany and other German-speaking countries came to Pennsylvania to what was then "Allegheny City" (now the Northside) – just across the river from the City of Pittsburgh. So many German speakers arrived, the area became known as "Deutschtown"." ^ "Archived copy". Archived from the original on 2012-03-06. Retrieved 2012-05-17. CS1 maint: Archived copy as title (link)"MÄNNERCHOR, DAMENCHOR, GEMISCHTER CHOR, ALPEN SCHUHPLATTLER UND TRACHTENVEREIN, PITTSBURGH DISTRICT KINDERCHOR, SCHÜTZENKAMERADEN, TEUTONIA HAUSKAPELLE, LUSTIGEN MUSIKANTEN, and 66 CARD LEAGUE"
^ Sass, Ed. "GermAmChron". www.eds-resources.com. ^ "Rating the Top Baseball Players of All Time". Baseballguru.com. Retrieved 2007-11-28. ^ "Ancestry of Barack Obama". Archived from the original on 2008-12-03. Retrieved 2008-10-09. Adams, Willi Paul. The German-Americans: An Ethnic Experience (1993). Bank, Michaela. Women of Two Countries: German-American Women, Women's Rights and Nativism, 1848–1890 (Berghahn, 2012). Baron, Frank, "Abraham Lincoln and the German Immigrants: Turners and Forty-Eighters," Yearbook of German-American Studies, 4 (Supplemental Issue 2012), 1–254. Bungert, Heike, Cora Lee Kluge, & Robert C. Ostergren (eds.). Wisconsin German Land and Life. Madison, Wis.: Max Kade Institute, University of Wisconsin-Madison, 2006. Conzen, Kathleen Neils. "Germans" in Stephan Thernstrom (ed.). Harvard Encyclopedia of American Ethnic Groups. (1980). pp. 405–425. Conzen, Kathleen Neils. Immigrant Milwaukee, 1836–1860: Accommodation and Community in a Frontier City. (1976). DeWitt, Petra. Degrees of Allegiance: Harassment and Loyalty in Missouri's German-American Community during World War I (Ohio University Press, 2012). Dobbert, Guido A. "German-Americans between New and Old Fatherland, 1870–1914". American Quarterly 19 (1967): 663–680. Efford, Alison Clark. German Immigrants: Race and Citizenship in the Civil War Era. New York: Cambridge University Press, 2013. Ellis, M. and P. Panayi. "German Minorities in World War I: A Comparative Study of Britain and the USA", Ethnic and Racial Studies 17 (April 1994): 238–259. Ernst, Robert. Immigrant Life in New York City, 1825-1863 (1949), detailed coverage of Germans and Irish. Gross, Stephen John. "Handing down the farm: Values, strategies, and outcomes in inheritance practices among rural German Americans", Journal of Family History, (1996) 21: 2, 192–217. Grubb, Farley. German Immigration and Servitude in America, 1709–1920 (Routledge Explorations in Economic History) (2011). Iverson, Noel. Germania, U.S.A.: Social Change in New Ulm, Minnesota. (1966). emphasizes Turners. Jensen, Richard. The Winning of the Midwest, Social and Political Conflict 1888–1896. (1971). Voting behavior of Germans, prohibition, language, and school issues. Johnson, Hildegard B. "The Location of German Immigrants in the Middle West". Annals of the Association of American Geographers 41 (1951): 1–41. Kamphoefner, Walter D. and Wolfgang Helbich, eds. German-American Immigration and Ethnicity in Comparative Perspective. Madison, Wisconsin: Max Kade Institute, University of Wisconsin–Madison (2004). Kamphoefner, Walter D., "Uprooted or Transplanted? Reflections on Patterns of German Immigration to Missouri," Missouri Historical Review, 103 (January 2009), 71-89. Kazal, Russell A. Becoming Old Stock: The Paradox of German-American Identity. (2004). Keller, Christian B. "Flying Dutchmen and Drunken Irishmen: The Myths and Realities of Ethnic Civil War Soldiers," Journal of Military History, 73 (January 2009), 117–145. Keller, Phyllis. States of Belonging: German-American Intellectuals and the First World War. Cambridge: Harvard University Press, 1979. Kulas, S. John. Der Wanderer of St. Paul: The First Decade, 1867-1877: a Mirror of the German-Catholic Immigrant Experience in Minnesota (Peter Lang, 1996). Levine, Bruce. The Spirit of 1848: German Immigrants, Labor Conflict, and the Coming of the Civil War. Urbana: University of Illinois Press, 1992. Luebke, Frederick C. Germans in the New World. (1990). Nadel, Stanley. Little Germany: Ethnicity, Religion, and Class in New York City, 1845-80 (1990). Otterness, Philip. Becoming German: The 1709 Palatine Migration to New York (2004) 235 pp. Ritter, Luke, "Sunday Regulation and the Formation of German American Identity in St. Louis, 1840–1860," Missouri Historical Review, (2012), vol. 107, no. 1, pp. 23–40. Roeber, A. G. Palatines, Liberty, and Property: German Lutherans in Colonial British America. (1998). Salamon, Sonya. Prairie Patrimony: Family, Farming, and Community in the Midwest (U of North Carolina Press, 1992), focus on German Americans. Salmons, Joseph C. The German Language in America, 1683-1991. Madison, Wis.: Max Kade Institute, University of Wisconsin-Madison, 1993. Schiffman, Harold. "Language loyalty in the German-American Church: The Case of an Over-confident Minority" (1987). Schirp, Francis. "Germans in the United States". The Catholic Encyclopedia. Vol. 6. New York: Appleton, 1909. Tolzmann, Don H. German-American Literature (Scarecrow Press, 1977). Trommler, Frank & Joseph McVeigh, eds. America and the Germans: An Assessment of a Three-Hundred-Year History. (2 vol 1985); vol 1: Immigration, Language, Ethnicity; vol 2: The Relationship in the Twentieth Century. Essays by scholars covering broad themes. Turk, Eleanor L. "Germans in Kansas: Review Essay". Kansas History: A Journal of the Central Plains 28 (Spring 2005): 44–71. van Ravenswaay, Charles. The Arts and Architecture of German Settlements in Missouri: A Survey of a Vanishing Culture (1977; reprint University of Missouri Press, 2006). Walker, Mack. Germany and the Emigration, 1816–1885 (1964). Where Have All the Germans Gone?. New York: Films Media Group, 1976. Wittke, Carl Frederick. We Who Built America: The Saga of the Immigrant. (1939), ch. 6, 9. Zeitlin, Richard. Germans in Wisconsin. 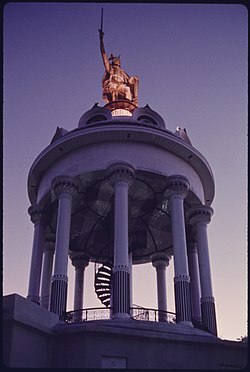 Madison: Wisconsin Historical Society, (2000). Kazal, Russell A. "Revisiting Assimilation: The Rise, Fall, and Reappraisal of a Concept". American Historical Review 100 (1995): 437–71. Kluge, Cora Lee. Other Witnesses: An Anthology of Literature of the German Americans, 1850–1914. Madison, Wis.: Max Kade Institute for German-American Studies, 2007. Ortlepp, Anke. "Deutsch-Athen Revisited: Writing the History of Germans in Milwaukee" in Margo Anderson and Victor Greene (eds. ), Perspectives on Milwaukee's Past. Champaign: University of Illinois Press, 2009. Miller, Zane L. "Cincinnati Germans and the Invention of an Ethnic Group", Queen City Heritage: The Journal of the Cincinnati Historical Society 42 (Fall 1984): 13–22. Kamphoefner, Walter D., and Wolfgang Helbich, eds. Germans in the Civil War; The Letters They Wrote Home. (U of North Carolina Press, 2006). Kamphoefner, Walter D., Wolfgang Johannes Helbich and Ulrike Sommer, eds. News from the Land of Freedom: German Immigrants Write Home. (Cornell University Press, 1991). "German". Chicago Foreign Language Press Survey. Chicago Public Library Omnibus Project of the Works Progress Administration of Illinois. 1942 – via Newberry Library. (English translations of selected German-language newspaper articles, 1855-1938). Chicago Foreign Language Press Survey: English translations of 120,000 pages of newspaper articles from Chicago's foreign language press from 1855 to 1938, many from German papers.